From using limited materials to design responses for specific scenarios, to prototyping future device based on a funky brief, a two-part workshop held at the Goldsmiths Design Summer School introduced the visiting students from Miriam College in the Philippines to critical approaches towards design and prototyping. 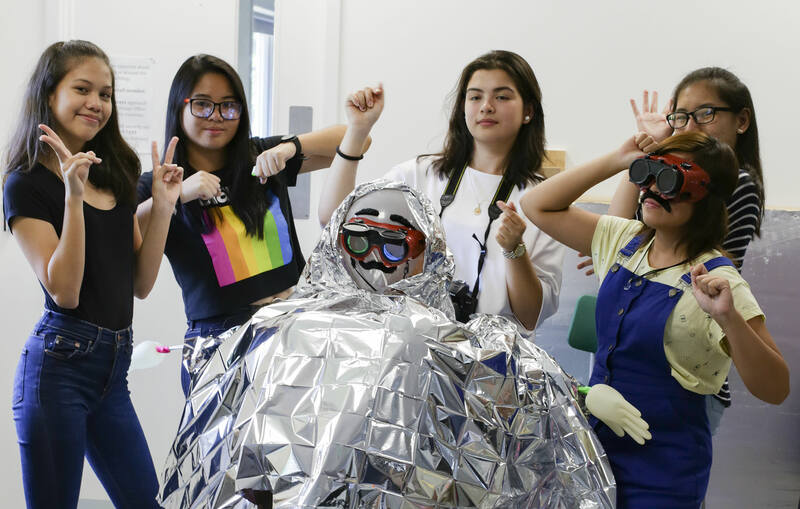 We were invited by the Goldsmiths design department to hold a playful hands-on workshop on speculative and critical design to the visiting college students from the Phillipines. Some of the students were hoping to apply for European design schools after graduation, and therefore the programme's aim was to introduce various disciplines, novel design approaches and methodologies. We created two exercises in an attempt give a first glimpse into the field of design fiction and critical thinking. 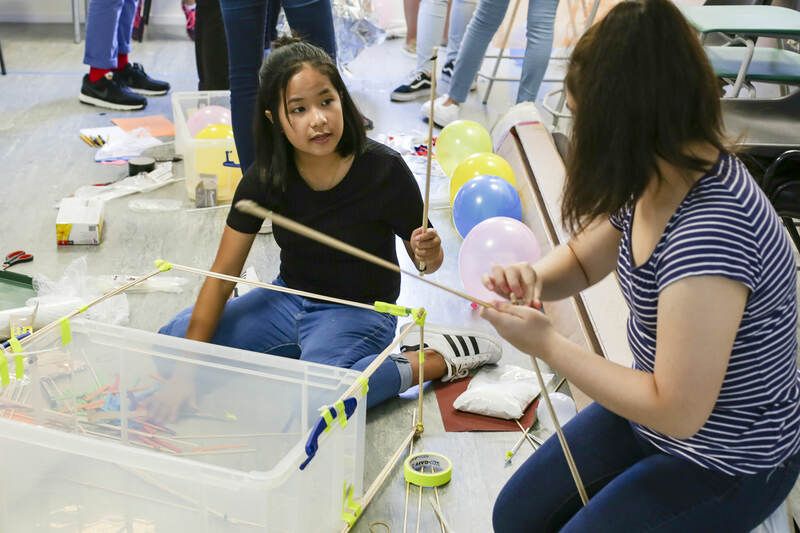 After an introduction to some critical design projects the students were shown examples of how the most inventive solutions arise under extreme circumstances with minimum resources. We talked about agile prototyping and designing for survival. We then led the students to form two teams and pick one of two crates. The first crate contained a scenario about being trapped after a major climate disaster and the need to survive, as well as a set of materials. Inside the second crate the students uncovered a political curfew scenario taking place in a major city, where the goal was to evade surveillance. For the curfew scenario the students constructed a Trojan Horse type decoy called “Chippy” which they would hide inside to avoid detection. 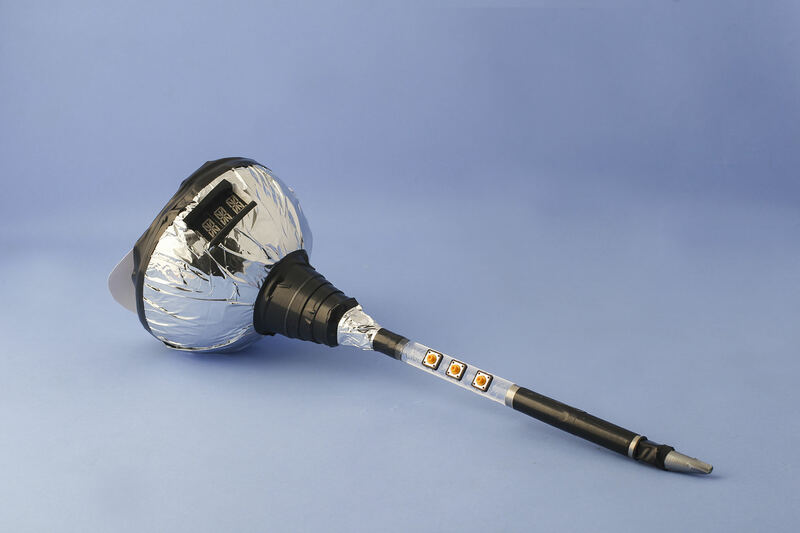 Chippy was cleverly crafted from a thermal blanket, balloons, electroluminescent wires and a set of welding goggles. The climate disaster response was a mockup of a small self-sustainable greenhouse what would allow to grow vegetables and trap animals. The second half of the day was dedicated for a custom-made brief entitled ‘Discount Futures’. We opened the exercise by showing some examples of non-functional yet polished prototypes and speculative design props. This time, the students split into three groups and had to fill out a template. We asked them random questions such as to pick a number between 1 and 100, a country, a price, a sense and an activity. We got the students to swap the templates between the groups, and revealed that this was to become their design brief for a product from the future. Random numbers became dates of production, countries defined where the product would be manufactured, activity set the target audience of the product, and so on. We laid out an array of items from things we had picked up from a local pound store, to some pre-programmed microcontollers and sensors. The students had to think of an idea to match the brief and use the provided materials to mock up their products. One brief was to design a product engaging with taste for elderly retired people in Germany, costing about 1600 euros. The group came up with an idea called the Aqua Zumba Bottle, a device that allowed elderly groups to revitalise their energy while exercising in the pool. 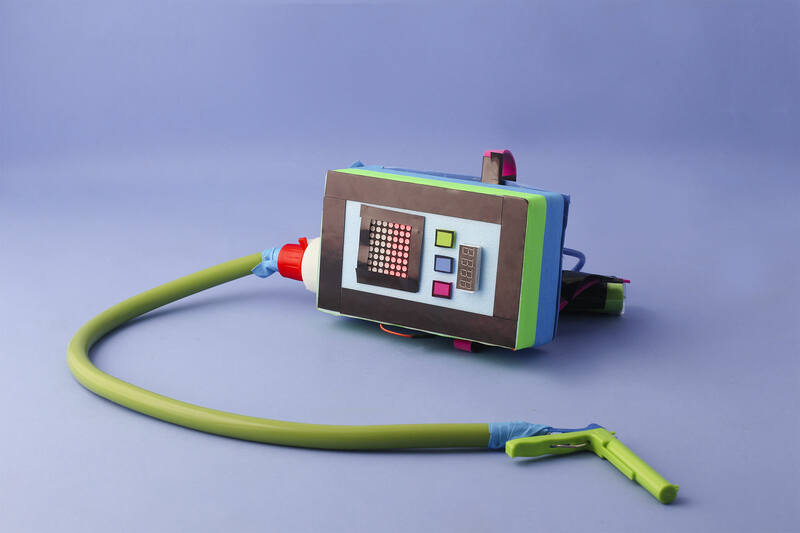 It contained buttons to select different flavours, a drinking tube and a led panel showing the amount of liquid left. Another brief was to design a product engaging with sight for middle aged gourmet chefs in France, costing about 500 euros. The group working on this came up with a 3D food drawing funnel. The device had a larger hopper on the top and a nozzle at the end to allow chefs to efficiently draw recipes in 3D. Whilst none of these items really functioned, they were meant to encourage the students to experiment with the form and fidelity of the things they designed, as well as the constraints of the briefs designers often have to meet for projects. Our goal was to introduce the visiting students to speculative design and get them to do some hands-on work whilst thinking about the future. It was a good and important insight into the visions the upcoming generations project towards the future, and the products they envision, even under slightly crazy and playful briefs like this.